Work. Life. College? Join Peirce at our open house to find out how you can do this. When is the right time to go back to school? Right now. If you don’t have your college degree, then there’s no time like the present to start working towards it. If you’re a parent, the kids’ school year is in full swing and it’s a good time to think about your own education and the opportunity you have to lead by example. Moms and dads (and yes, grandparents, too) play a crucial role in establishing a love of learning in children. And one of the best ways to get through to your kids is to practice what you preach. Show them how to respect education by educating yourself! By studying alongside your kids, you’ll prove to them that an education is important. And no matter how old they are, children are more likely to value education if they see the adults they look up to doing the same thing. Wondering how you can possibly fit education into your busy life? We watch our students do it every day, and we know you can do it too. Wondering where to start? We have a few solutions for you. 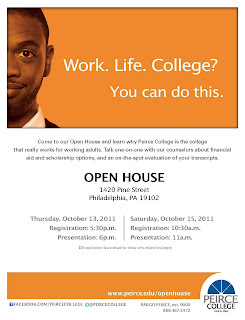 Visit PhillyLearners.com, a free resource to help working adults in the Philadelphia region earn their degree. 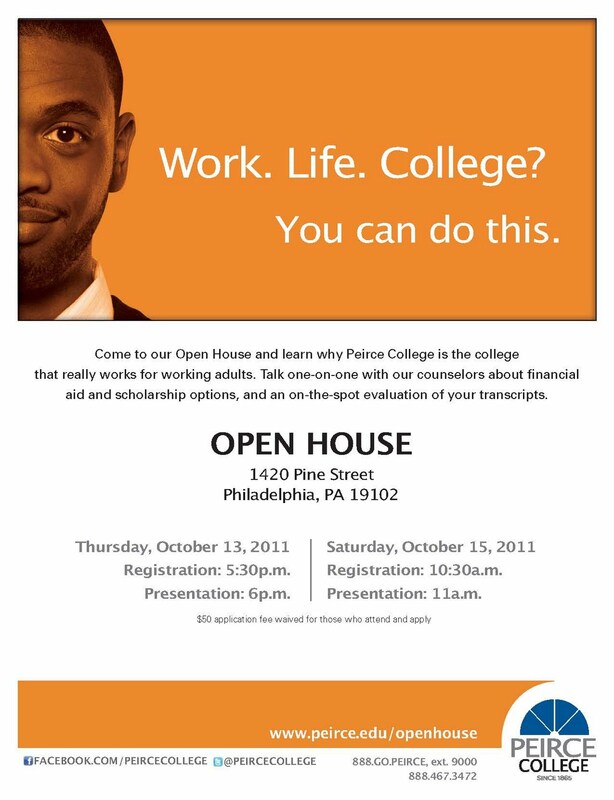 And attend one of our upcoming open house dates to learn why Peirce is the college that really works for working adults. At the open house, you’ll have the opportunity to talk one-on-one with our counselors about financial aid and scholarship options, learn about the programs and support services designed to help balance life while earning a degree, and receive an on-the-spot evaluation of your transcripts. An added bonus -- the $50 application fee is waived for those who attend and apply. All you have to do is show up, and you’re on the path to getting the degree you’ve always dreamed of. Join us on campus (College Hall, 1420 Pine Street) on Thursday, Oct. 13 at 5:30 p.m. or Saturday, Oct. 15 at 10:30 a.m.